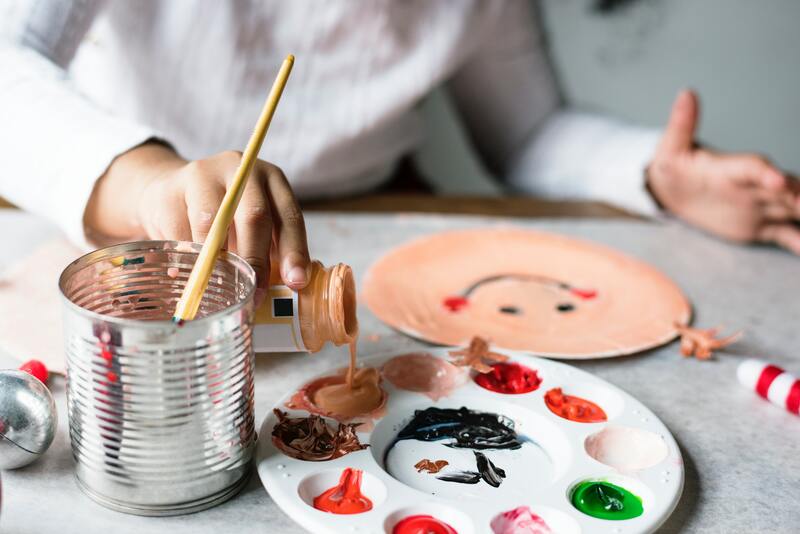 During the school holidays it can be so hard to find things to fill the time, so why not embrace arts and crafts? It’s not so bad when it’s warm and dry, but on those rainy days it’s all too easy to just turn the TV on. 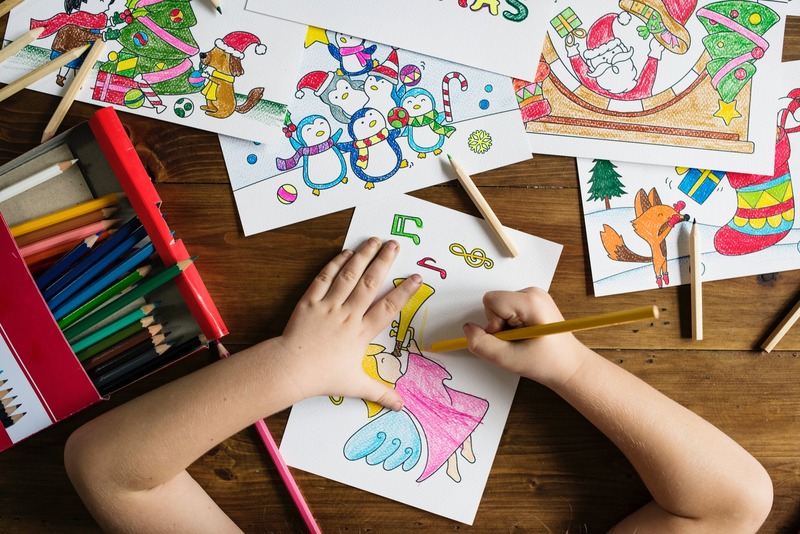 Arts and craft activities are an excellent alternative to screen time, and can be done no matter the weather. Arts and crafts are not only fun but can actually aid development in a number of areas. Obviously, crafts can encourage and develop creativity. However more importantly it gives children the opportunity to just ‘have a go’. This open ended freedom and confidence to experiment and explore is something we often lose as we grow up. We worry too much about doing it ‘wrong’. With arts and crafts there is no right or wrong. Even if at the end the finished product is just a pile of brown mush, and not something that will proudly be displayed on the mantelpiece. Just exploring different ideas, processes and textures can be fun on its own. If the end result is brown mush it helps children to develop resilience. It teaches them learn to problem solve when things don’t go the way they planned. This sort of creative exploration is particularly important. Schools often have so much pressure to produce good results in Maths and English, often resulting curriculum time for creativity to be limited. Even when there are opportunities for art in school there will still be a fair amount of structure and constraints. The subject, resources and the amount of time to complete the project will probably be decided for them. So when doing arts and crafts at home, where possible, give children a choice. Deciding what to make, with which materials, in their own time, will give them a great sense of empowerment. Arts and crafts can also encourage the development of fine motor skills. For a young child this may be learning to hold and control a paint brush. For an older child it may be carefully colouring in between the lines or cutting around fiddly shapes. Picking up a tiny googly eye and sticking it in exactly the right place can be a real challenge, even for grown ups! But children will often persevere until they can finally master this sort of challenge. The resulting pride about the finished product is so much greater because the task was so hard. Of course, activities like this can also cause a great deal of frustration and stress (for both you and them!) We should be ready to step in to help with encouraging words and actions (but at the same time being careful not to step in too quickly). Showing your love and support over something this small lets your child know you will be there for the bigger things too. 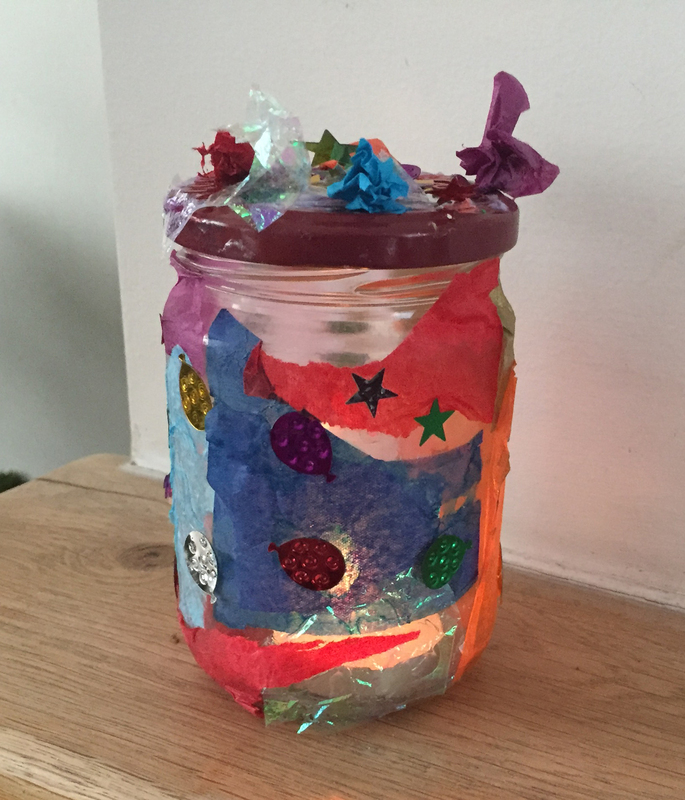 If your child is afraid of the dark, decorate a lantern. But one of the biggest benefits of arts and crafts is, if you find the right project, your children will be entertained long enough for you to finish your cup of tea. So what’s your excuse? I’d love to do arts and crafts with my kids but…. Not all craft is messy. Pipe cleaners, especially the sparkly kind, can provide hours of fun with hardly any mess at all. 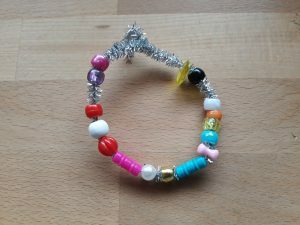 You can twist different colours together, or thread on beads, to make a bracelet. 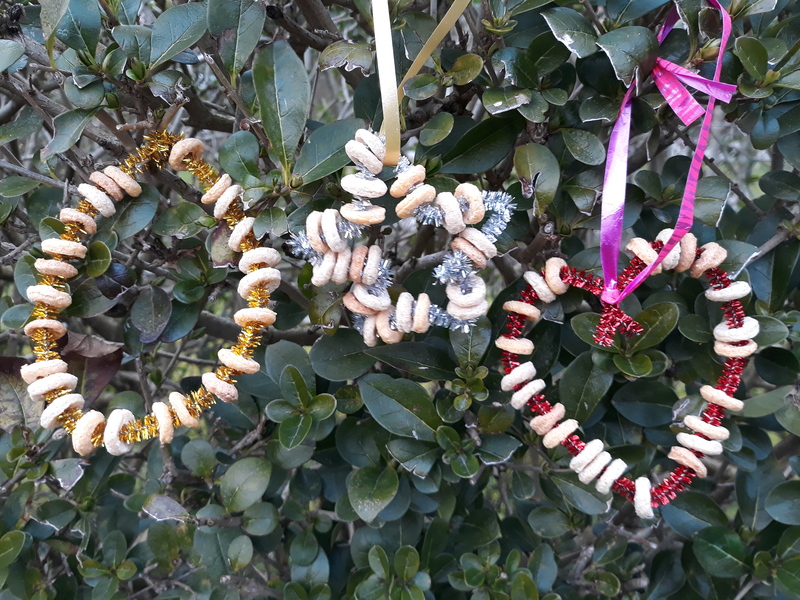 You can thread on cereal hoops and make a bird feeder. Bend them into interesting shapes and then twist them around the top of a pencil to make a pencil topper. You don’t need mountains of glitter, pom poms, googly eyes, etc. One of the best craft activities is salt dough. It can be made with things you probably have in the cupboard. To make salt dough all you need to do is mix together a cup of flour, half a cup of salt and half a cup of water. Then knead it to make a dough. It’s fun to manipulate, you can roll it into a ball or a sausage, squash it flat, use cutlery or pastry cutters to make shapes and patterns. 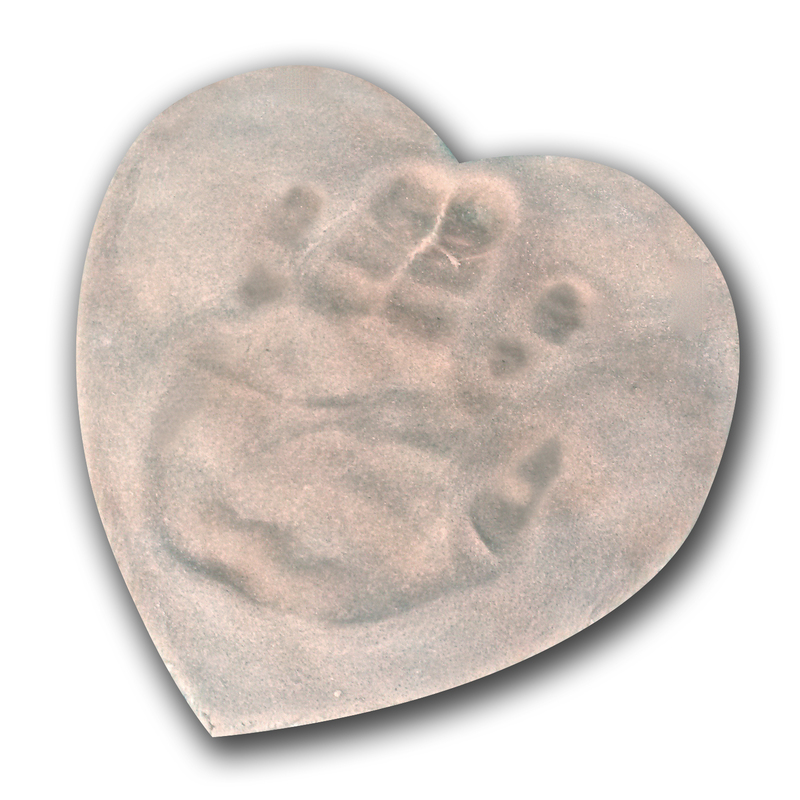 If you want to be a bit more adventurous you can make a beautiful handprint or footprint keep sake. When you are finished, if you don’t want to keep what you have made it can be squashed up. The salt dough can be used again another day (just keep it in an air tight container and discard it if it goes soggy or mouldy). If you would like to keep your finished project you can just leave it to air dry in a warm place. It will take a few days sometimes up to a week to go hard. Cooking it speeds up the process, but it can also sometimes make it go a bit darker. If you want to cook it, put it in the oven on 100°C for about 3 hours (less if it’s quite thin.) Turn it over about half way through the cooking time. When it’s hard, you can add decorations like paint or glitter, or just leave it plain. First of all, don’t forget the benefit of ‘just having a go’ and ignore the worry of getting it wrong. The following project will look interesting no matter what! Get a clean and empty glass jar, some PVA glue, a paint brush and some tissue paper. You can also use any other interesting paper and decorations you may have lying around. Left over wrapping paper, sweet wrappers, stickers, pictures cut out of magazines. You might even have some craft materials like glitter, sequins or pom poms. Use the paintbrush to cover the outside of the jar with glue. Then stick on the tissue and any other decorations you fancy. You can add a small light or a candle and you have a lantern. 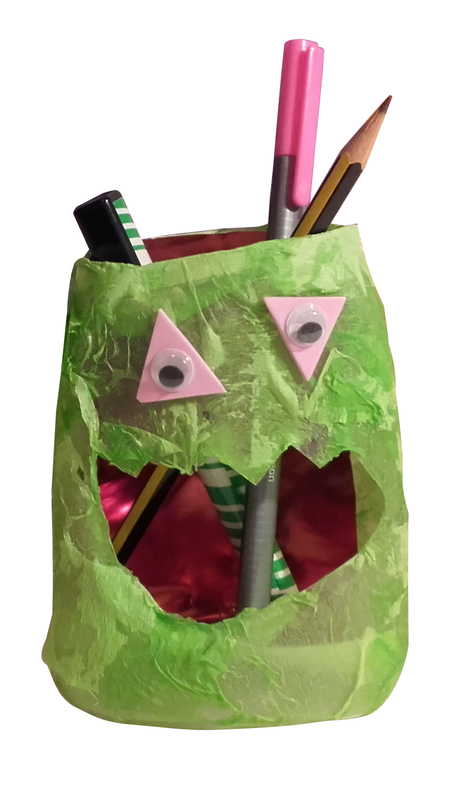 Or fill it with pens and you have made an exciting pencil pot. You can also do this with a plastic bottle with the top cut off. Obviously don’t use a real candle inside if you are making a lantern, as it could melt the plastic or cause a fire. Or for younger children you can add some rice to a plastic bottle, put the lid back on (and some masking tape to keep it on). Then cover it all in tissue paper, and you have a shaker! But if you still can’t face doing craft activities look out for arts and crafts activities run at libraries, museums and by other groups like Crafty Kids Wirral. There are some good ideas for Christmassy crafts here. 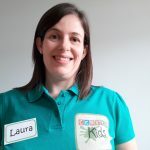 Laura runs Crafty Kids Wirral; providing arts and crafts activities for children across the Wirral. Mostly during the school holidays, when parents are desperately trying to find things to keep their kiddies entertained! She is a mummy to two children who are at completely opposite ends of the arts and crafts spectrum. A 6 year old daughter, who is highly creative, fiercely independent and a bit of a perfectionist, and so could spend hours on a project. And a nearly 3 year old son, who just enjoys making the most amount of mess possible with the craft materials (and anything else nearby.) He rarely focuses on one project for more than within 3 and a half minutes!